The Webb-Deane-Stevens Museum School provides hands-on history lessons for preschool through college age students. It is at the heart of the Museum’s mission to educate and teach American history through the creative use of its historic houses and collections. The trained teachers and guides on staff are always eager to share their love and knowledge of the past with others. Each program is adapted to the special interests and needs of the people participating in order to create a memorable and meaningful learning experience. 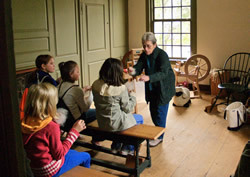 Programs are offered year-round using our four 18th-century houses and Historic Wethersfield as the classroom for thirteen separate offerings (listed below). Students participate in an average of four programs each day that they are at the Webb-Deane-Stevens Museum, often with a lunch break in the Webb Barn. Each thematic curriculum unit combines a visit to one or more houses, or the Ancient Burying Ground, where children look at and learn about the artifacts, followed by a hands-on participatory learning activity. Most programs are appropriate for scout groups, and we are happy to make the education room available for snacks and meetings before or after the programs. We are also pleased to visit schools as part of our Outreach Programs with slide shows and/or artifacts and hands-on activities based on the programs listed below. Outreach Programs provide students with interactive experiences right in the classroom. Each presentation or “session” is delivered by one of our museum teachers and is designed for up to 30 students. The production, preservation, and preparation of food in 18th century America was no simple task. In the Deane kitchen, students learn how food was prepared and preserved in the 1770s and learn how to make butter. They examine the dining room where Washington and Adams dined, and learn about how the Deanes might have entertained guests for tea in the front parlor. They then return to the Webb House education room for their own tea party, with hot tea and biscuits served on a china tea service —observing proper 18th-century manners, of course! Students learn about the important and time-consuming chore of processing the natural fibers of flax and wool into cloth. In the Deane House they card wool and see a spinning wheel and loom in action. They will also examine early textiles such as linens, samplers and clothing worn during colonial times. Students examine the medical practices and theories of early New England. They visit a sickroom set up in the Stevens House and an outhouse. They learn about herbal medicine and make a scent bag. Using character cards, students explore the lives of Pompey, Hagar, and other enslaved African Americans in 18th century Connecticut. They will tour the slaves’ quarters at Silas Deane’s house and play a traditional West African game. The home of Isaac Stevens provides the setting for learning about an important early American craft. Students will also learn what some of these trades were and what it was like to be an apprentice in the early 1800s. In this program students will have the opportunity to punch tin, which was an important early American trade; and while touring the house, students will be able to spot items that were made by early American tradesmen. Soldier in the American Revolution! 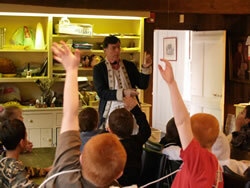 Students learn about the rigors of military life during the American Revolution. Also mentioned is the role of women during the war. Students explore a soldier’s knapsack. Sam Webb, the son of the builder of the Webb House and an aide-de-camp to General George Washington, is used as an example. George Washington Really Did Sleep Here! General Washington made three visits to Wethersfield including a visit in May of 1781 when he stayed for five nights at the Joseph Webb House. While touring the Webb House, students visit the Washington bedchamber and see Wallace Nutting murals depicting Revolutionary War scenes. In the education room, they will learn both myths and facts about George Washington, and write with quill pens. The First Church of Christ in Wethersfield was built between 1761 and 1764. Its tall steeple was once climbed by John Adams and George Washington attended services there. Students learn the importance of the meeting house as the center of community life. They will also participate in a town meeting to support their comrades in Massachusetts after the British closed the port of Boston as punishment for the the Boston Tea Party. The children’s exhibits and interactive classroom on the second floor of the Stevens House are used to teach about the dress, work, life-style, schooling and play things of children 200 years ago. Using the artifacts from the Stevens House, students will attend “school” and play with reproduction toys and games. This animal was used for food, leather, and labor. 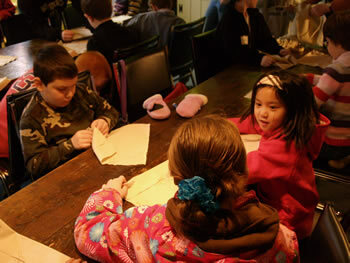 Students listen to a story, visit a colonial kitchen where they make butter, examine artifacts associated with the cow, and then do a hands-on activity. This animal was used for wool. Children discover the time-consuming process of turning raw wool into fabric. They explore the role of children in this process by carding the wool themselves, observing wool being spun into thread, and thread being woven into fabric. The program concludes with a story. Call the Education Coordinator at 860 529-0612, extension 12, or email us to inquire about bringing your group to the Museum School! On Site Programs: Each separate program is $3 per student ($12 for four programs). There is an additional $1 per student surcharge for materials for Isaac Stevens: Leatherworker. Outreach Programs: For the first session of each program is as follows: within a 20-mile radius $100, 40-mile radius $125, 60-mile radius $150. $50 for each additional session. Please note: roundtrip mileage is charged for every museum teacher sent. All programs begin at the Webb-Deane-Stevens Museum, 211 Main Street, Wethersfield, Connecticut. For detailed directions, CLICK HERE. From April – November, the Webb Barn and Museum gardens are available for picnic lunches. Arrangements must be made when booking your field trip. The museum gift shop is available year round to groups of twenty or less. From April-November, the mobile gift shop can be set up in the barn so that students can easily shop during lunch. A variety of fun and educational items, many which are reminiscent of the colonial period, are made available to the students. Most items range from $1.00 to $10.00. Teachers receive a 10% discount on all items. The mobile gift shop is usually a big hit with students and teachers alike. 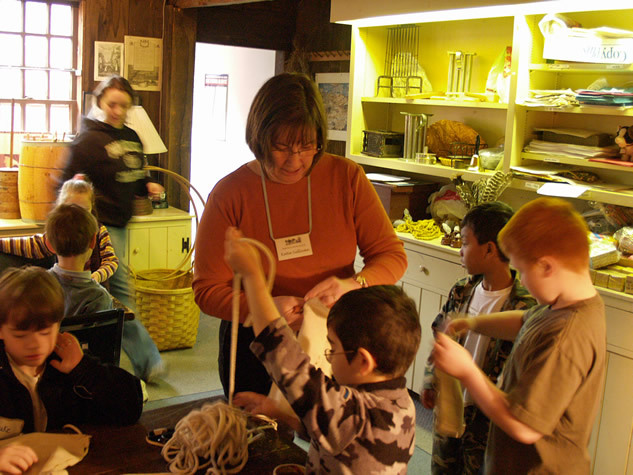 For every ten students, groups are required to provide one chaperone or teacher to help the museum teachers maintain order and assist with the hands-on activities as needed. There is no charge for required teachers and chaperones. Other adult visitors with the group, above the required number of chaperones, will be charged an additional admission fee. The Museum limits the size of each program to a maximum of twelve to prevent overcrowding in the historic houses. If the entire group is larger, split sessions of each program for up to twenty students can be arranged for a maximum of eighty students for four programs or sixty students for three programs. Each school group usually signs up for three or four programs per visit. Each program lasts forty-five minutes. Details can be worked out with the Education Coordinator during the booking process. Day-long teacher seminars can be arranged on life in the 18th and early 19th centuries in Connecticut. Programs will be planned and adapted to meet the needs of your group. The Webb barn is available for lunch. There are also many restaurants nearby- http://historicwethersfield.org/restaurants.html. For more details, please contact the education coordinator.